I’m not a huge football fan. At least not the pro game, so I don’t go to a lot of games. I have been to one game at the “New” Soldier Field and one game at the “Old” Soldier Field. I’ve almost seen more concerts at the venue than I have football. Still, being a Chicago sports fan, I could write a whole blog just on the look of the building. I’m not one of those people that think sports teams need to stay in a building because of it’s “historical” significance (I’m looking at you drunk frat boys on the northside). As a fan, I like to be comfortable if I’m paying top dollar to see a sporting event and most of all, I want to see the show. After having seen games at both the old and new configurations of Soldier Field, I can tell you, the new one blows the old one away. Still, it’s an eyesore in a beautiful Chicago skyline. Soldier Field is located just off of Lakeshore Drive on the south side of Chicago’s downtown. Chicago Mayor Richard Daley was very vocal about keeping the Bears in Chicago, but there’s was no place to really put a new stadium. 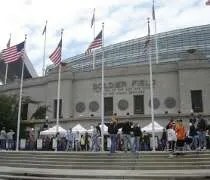 The historical society was adamant about not letting Soldier Field being torn down. 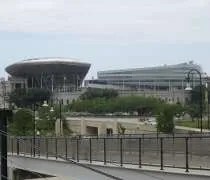 Since historic preservation laws only prevent the exterior from being destroyed, the designers on the new Soldier Field gutted the place and landed a spaceship on top of the existing stone structure. Technically, the old walls and columns that defined the building are still there, but they are overshadowed by the monstrosity that was set on top of it. From a visual standpoint, it’s the ugliest sports stadium in the country. The historic designation was eventually stripped and Chicago was left with a pimple on the supermodel-like face that is the skyline. I have never been outside the United States. I’ve never had any reason. Hell, until a few years ago, the only time I had been on an airplane was my 8th grade class trip to Washington DC. Traveling farther than driving distance just wasn’t something my family did. 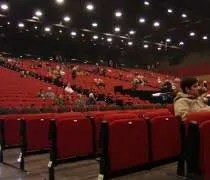 Now, Canada is within driving distance and there was a concert J wanted to see at Caesars Windsor, so I did all the research about what we need to travel back and forth to Canada then bought a couple tickets to see Miranda Lambert. Getting to Canada and back home had literally kept me up at night for a week. People do it everyday, so I’m not sure why I was so worried about it, but I was just anxious about making sure I knew where we were going and what we needed to get back into the country. Since we were downtown in Detroit, the GPS sent us to the Detroit-Windsor tunnel. I had no idea what to expect. I paid the toll them waited as five lanes converged down to one. I think J was a little nervous about using the tunnel, but I just do what the GPS tells me. It took about a half hour to get through. When your stuck in bumper to bumper traffic under a river, you do kind of start thinking about what could go wrong. We got to the other end and talked to the border agent who wished us luck when I told him where we were headed.